I don’t eat out a lot in Muskegon. I don’t usually have the time and when I do, I’m not really familiar with the options. I typically look for quick service places and anything I really want to try is always more of a sit down. Late last week, I was in Muskegon by myself and not really on a time crunch. I pulled in to a parking lot and started looking some places up. Pizza sounded like a good idea and I came back across a pizza place that was recommended to me several years ago. It didn’t take me long to find something that looked good, so I put in an order and headed to pick it up. 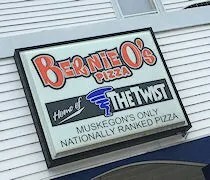 Bernie O’s is an interesting little pizza joint on the corner of Center Street and Ruddiman Drive in the small city of North Muskegon. The building barely looks like it contains one of the top pizza joints in the area. From the street, a couple of banners hanging off the building is all that marks it. I was a little confused because I couldn’t figure out where to park. There is no street parking on either street around it. I headed to the Wesco next door because I needed gas and that’s when I noticed a parking lot behind the building on Ruddiman Drive. The parking lot in back is actually the main entrance to the restaurant. Just inside the doors is the register counter and the kitchen. Both ladies working the register were on the phone taking orders when I stopped in, so I stepped back and waited. Their website mentions they are working on online ordering which I would have to assume would make their life a little easier. The menu at Bernie O’s is pretty typical pizzeria fare. They have a line-up of toasted subs, salads, stromboli, wings, bread sticks, and of course, the pizza. Sure, you can go simple here and order your typical pepperoni pizza, but that’s no fun at a place like this. 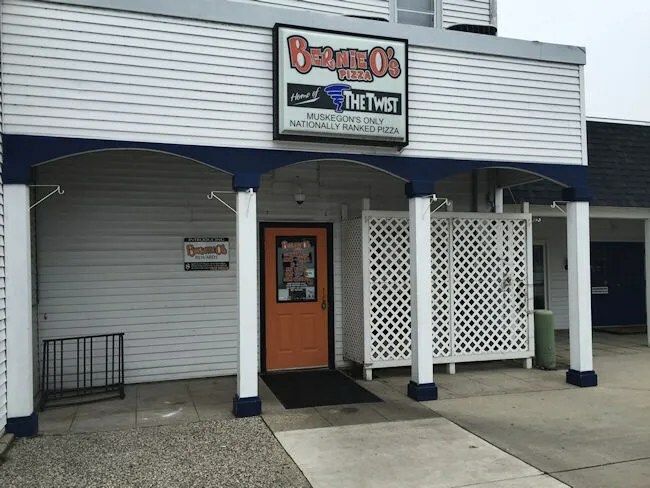 Their main pizza is called The Twist. 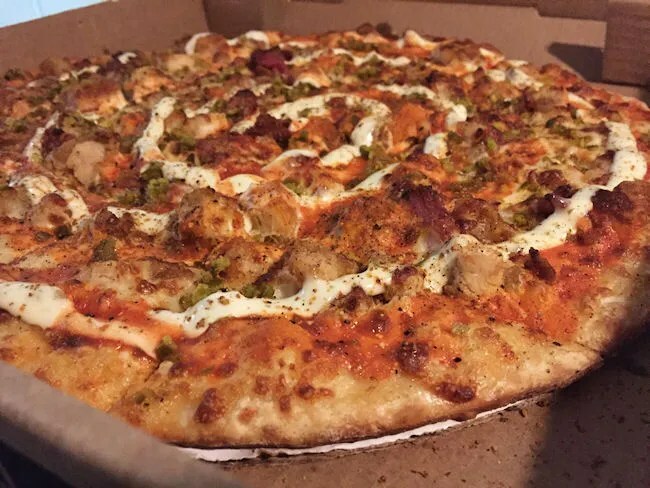 It’s won a number of accolades and is the centerpiece of their pizza menu. That pizza has a secret yellow sauce, cheese, breaded chicken, and bacon then is topped after coming out of the oven with pineapple, tomato, yellow peppers, jalapeno peppers, and their homemade buttermilk ranch. My wife saw the take out menu I brought home and was severely disappointed that this pizza place was in Muskegon and not closer to us. To her, that pizza sounded amazing. To me, it had too many veggies plus, there was another one I wanted to try. I chose a 14″ Fire Bird. 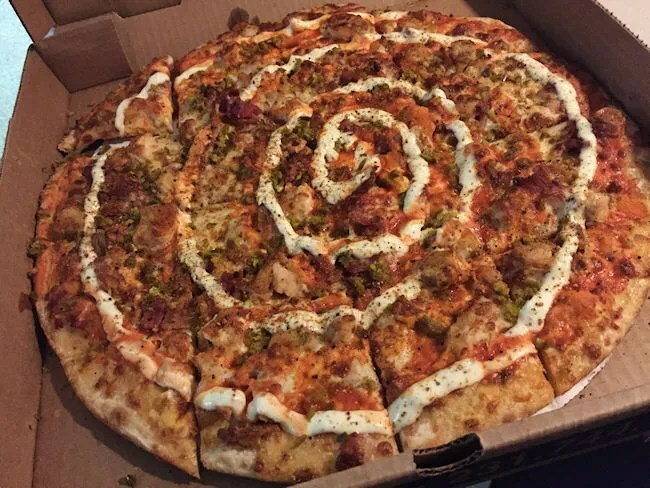 This pizza is the Hotwing Pizza (breaded chicken, wing sauce, cheese, celery, Frank’s Red Hot and Buttermilk ranch) with the addition of bacon and jalapeno bits. It also has three levels of hotness. The third level has ghost chili powder. I like hot, but not so hot it’s not enjoyable, so I chose Level 2. The pizza took about twenty minutes and cost a little under $17. It was ready when I got there to pick it up and once the cashiers were finished with the take out orders, they rung me up and I got on my way back to Grand Rapids. The first thing I noticed, and loved, about Bernie O’s pizza is the crust. It’s a thin and crispy crust with a corn meal coating that is cut into squares instead of triangles. All my favorite Chicago pizzas are done like this and in my opinion, that’s the best way to cook a pizza. Right off the bat, I was excited about this pizza and was not disappointed once I took that first bite. As advertised, the pizza was hot. It was like a hot chicken wing…not overpoweringly hot, but just hot enough. The chicken chunks were quite large and there was quite a bit on each slice. The jalapeno and bacon bits were a little harder to notice but every so often, I’d bite into a jalapeno and know immediately what just happened. The only thing I wasn’t wild about was the ranch. Now, full disclosure, I don’t really like ranch dressing. I missed it on the menu or I may have left it off. It didn’t torpedo the pizza…I still ate 3/4 of it before offering it to my coworkers, I just think I would have enjoyed it more without the ranch…now if it was a bleu cheese sauce…that would have been amazing. Normal people like ranch and I’m sure a normal person would love their homemade buttermilk ranch. It’s just not my thing. Bernie O’s lived up to the hype. This pizza was pretty amazing. The crust sold it for me right away. I think you can put almost anything on a well done crust and have an amazing pizza. 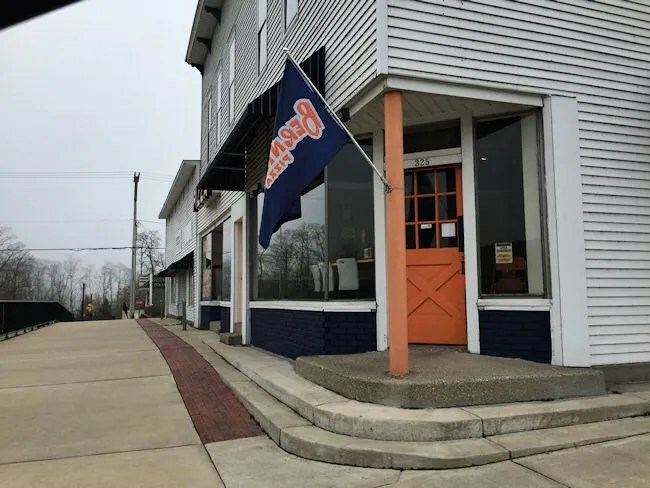 Bernie O’s doesn’t put just anything on their pizzas though and the creative topping choices with quality ingredients makes for a can’t miss pizza along the Muskegon Lake shore.